We are the hired help! 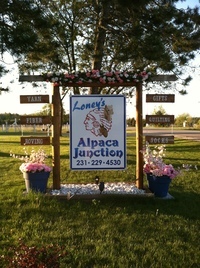 Loney's Alpaca Junction is family-owned and operated just outside of Lake City, Mi. Since we started our farm in 2003 with only three Alpacas, we have now grown our heard to over 70, with most being "Home Grown" with some help of selective off farm breedings. Stop by and check out our Alpacas. we have a great selection of Females, yearlings, and of course, some great award winning studs! All of our alpacas are registered with The Alpaca Registry and all participate in the AOA EPD program, so you know exactly what your are getting when purchasing an Alpaca from us. We also have miniature donkeys. Starter packages, fiber animals, or adding to your herd, please stop by and take a look at our Alpacas!